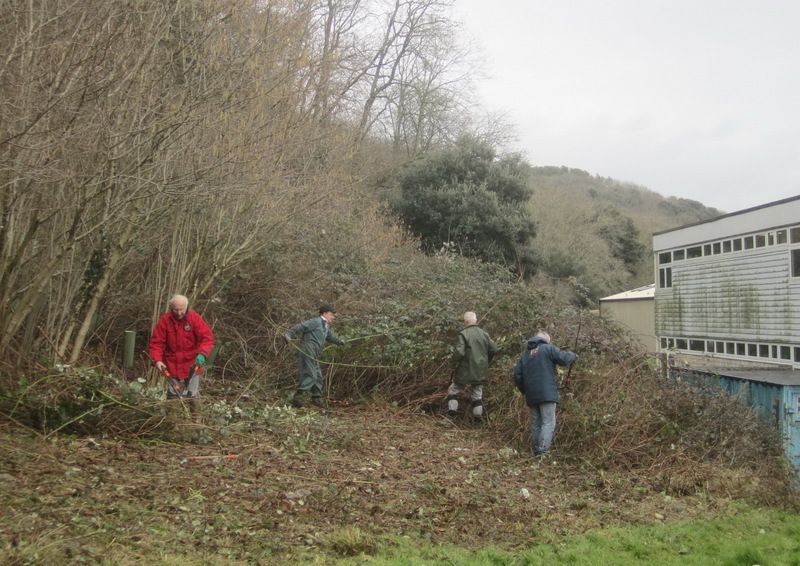 Dial Hill – cutting bramble on the south-east slope above the cricket club ground as the first step towards restoring the grassland. The brash is burnt on site the following week. Quinney’s Wood – the northern boundary hedge, which contains a mixture of native species including hawthorn, blackthorn and hazel, needs reducing in breadth and height. The front is trimmed first, and the final height will be 6ft for ease of future management. Prunings are collected and burned. Crown raising a spreading oak tree on Dial Hill to improve its form, to allow sunlight to the ground below and to enhance views from the seats above. Rough vegetation remaining below is brush-cut and raked off. 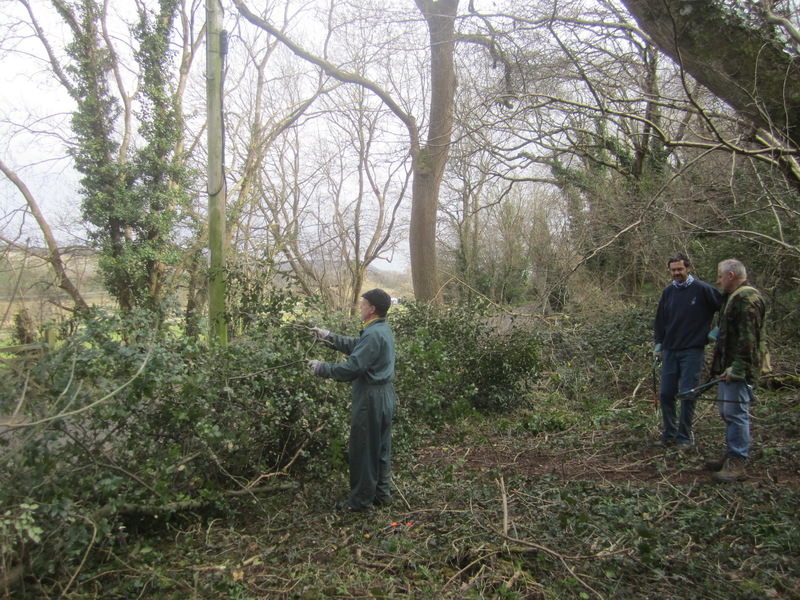 Seasonal work starts again in Clevedon School woods, cutting and raking up bramble re-growth and felling young sycamore to improve light and access to the woodland. Work continues into November. Scrub clearing continues on Dial Hill with the aim of restoring grassland, promoting the well-being of mature native trees and re-creating views to the south-east and south-west. The Woodcutters set out to control encroaching scrub and to improve views on Dial Hill. Poets’ Walk – sycamore is felled to allow light into a patch of scrub, and views to the Pier and to the Welsh coast are improved by removing an ash tree. 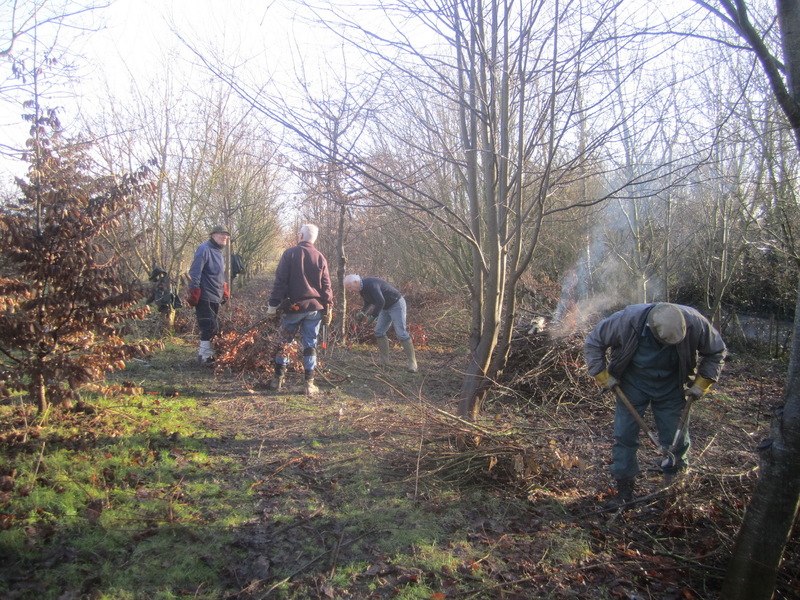 Brambles are also cleared. Quinney’s Wood – 3 scythes, 2 brush cutters and a lawn mower are used for the late summer cut of grass and vegetation, which is left to dry before raking up next week. The Millennium Community Orchard mown, and arisings raked off. 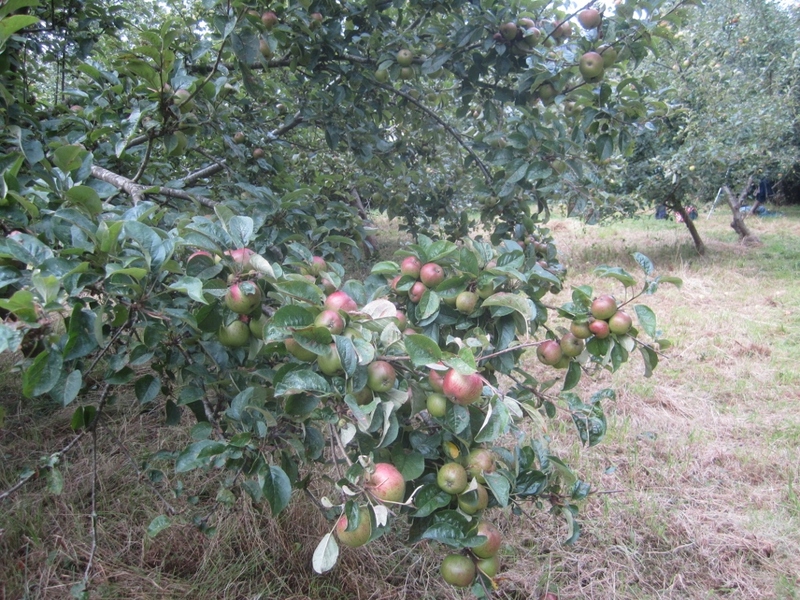 A good crop of cider apples this year. A new venue! The Woodcutters clear the overgrown Zig Zag steps above Hill Road. 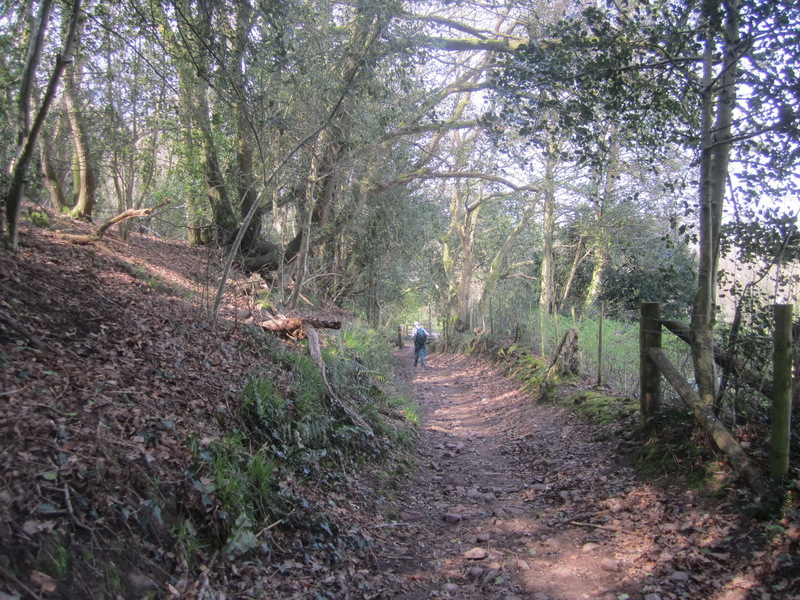 Quinney’s Wood – the paths are mowed and raked off again and the lower path area tidied. Quinney’s Wood – the roadside hedge is kept trimmed to increase traffic visibility and invasive weeds such as creeping thistle and ragwort are pulled from the grassland. Quinney’s Wood – oak and maple are crown raised to improve access and light to the steps, path and signboard near the stile at the Davis Lane entrance. Many apple trees on the edge of the Millennium Community Orchard are overshadowed by other trees. Sycamore branches and hawthorn are cut to allow in more sunlight. The Woodcutters work on Dial Hill for the first time, pulling ragwort. The spread of ragwort, although native to Britain, needs to be controlled as it is poisonous to horses. Strawberry Hill Woods – having felled sycamore saplings and done a general tidy-up in 2012 the Woodcutters revisit to trim sycamore regrowth and bramble, and scythe nettles. 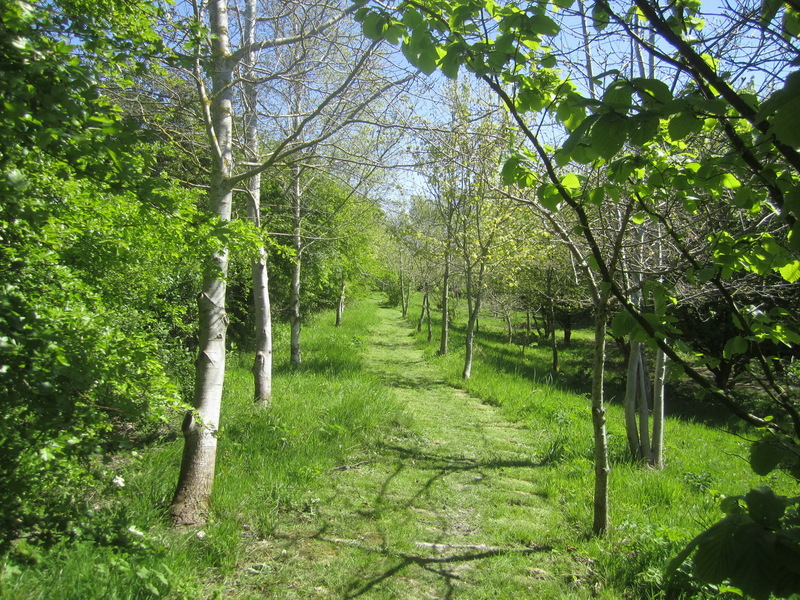 The main paths in Quinney’s Wood need mowing again in July. 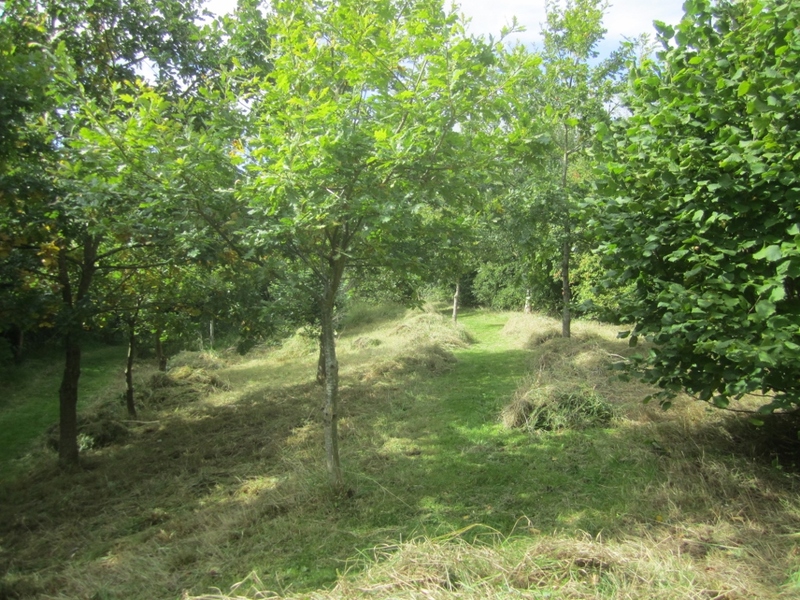 The Millennium Community Orchard – the path and picnic area, as well as areas of rank weeds, are brush cut and raked. Nettles are scythed and access points are cleared. 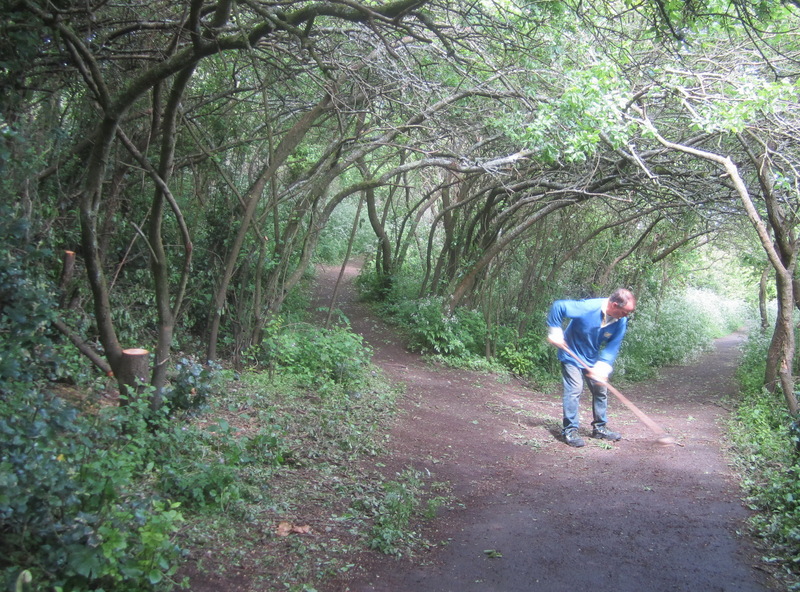 Poets’ Walk – The Woodcutters assist the Friends of Poets’ Walk by scything and raking a weedy section of Wain’s Hill grassland as well as by clearing an unsightly patch of nettles. 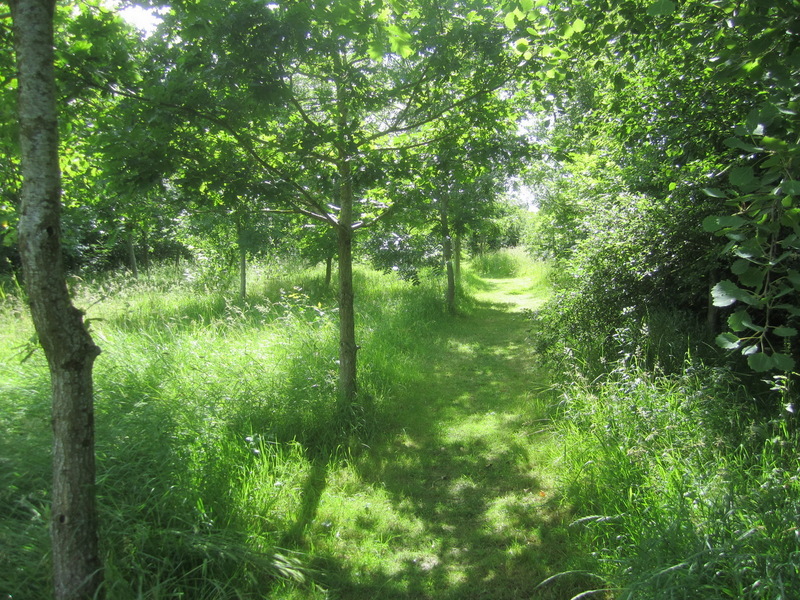 Quinney’s Wood – the main grassy paths are mown and arisings raked off. The Millennium Community Orchard – the main grassy path and areas with rank weeds are strimmed and the picnic area scythed. Arisings are raked up and composted on site. 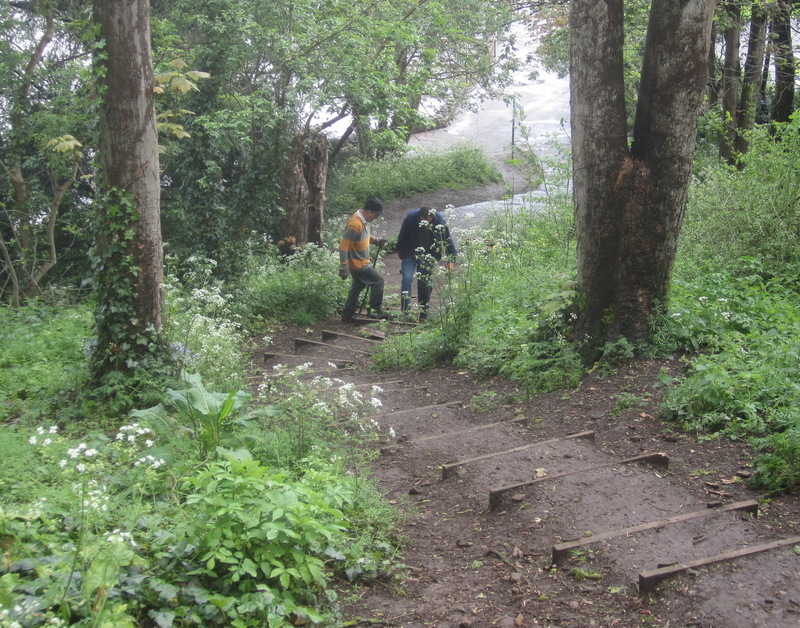 Maintaining woodland steps in Salthouse Wood including the replacement of nine risers. Sycamore regrowth cut back during the same working party. The southern boundary of Norton’s Wood – self-seeded Holm oak is removed from both sides of the track above the M5 motorway. Sycamore is removed in accordance with Norton’s Wood Management Plan. Here, regrowth is cut back and laid as a ‘dead hedge’ to provide a habitat for wildlife. 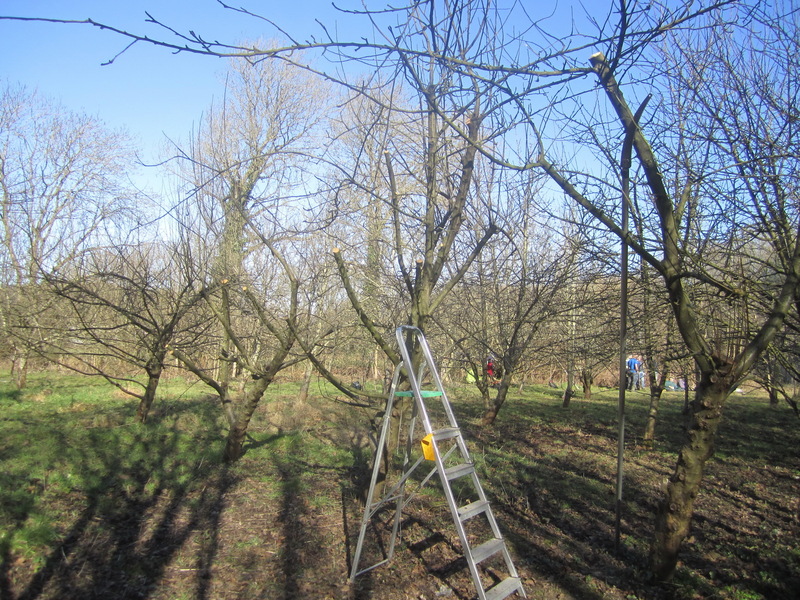 Millennium Orchard – the largest cider apple trees receive remedial pruning to help bring them back into shape. Long extention branches are trimmed back and prunings burnt. Cider apple trees are pruned and the arisings burnt at the Millennium Orchard. Norton’s Wood – to discourage trespass into the wood, particularly by vehicle, roadside hazels are laid as a hedge and other gaps are blocked with cut branches. Clevedon School – with the help of 6th Form students and their director an old chainlink fence is dismantled and the recycled materials used to construct a new fence around the 6th Form vegetable and fruit tree plot. The view over Marine Lake and Clevedon promenade to the Pier is restored by cutting back ivy and self-seeded trees. There used to be a seat here. 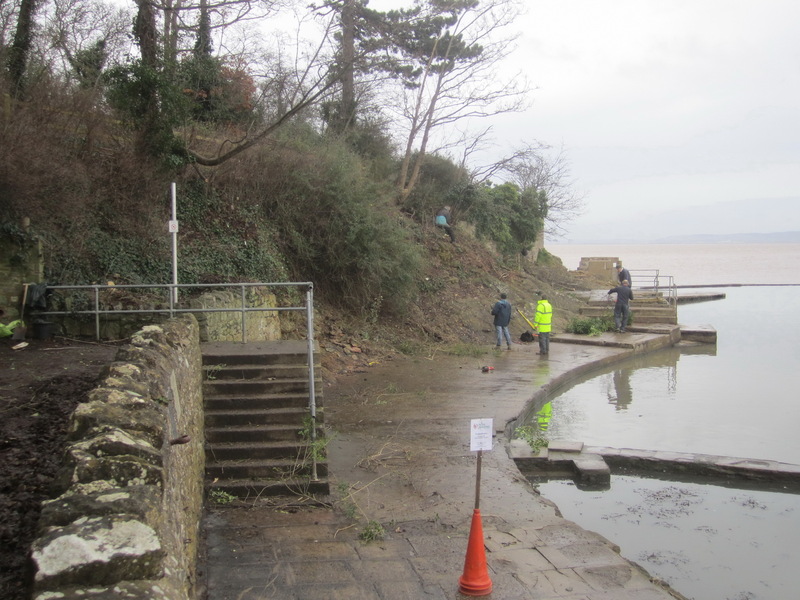 The New Year sees the Woodcutters back at Marine Lake for a second session of scrub clearing before the contractors move in for the Heritage Lottery funded lake restoration. More information on our Marine Lake blog page.